INDIANAPOLIS - Recognizing not only those who give financially to Indiana State University but also those who give of their time, energy and devotion, the ISU Foundation conducted its annual Philanthropy Awards Celebration Saturday at the Hyatt Regency Hotel. The foundation took its 2010 ceremony to Indianapolis in recognition of the growing involvement of the university in central Indiana, home to 15,000 alumni. The foundation's board of directors met in Indianapolis earlier in the day and the university's wind orchestra and concert choir performed Friday at the Scottish Rite Cathedral, playing to a packed house. On Saturday the foundation presented the inaugural John P. Newton Spirit of ISU Award to Maurice "Mauri" Modesitt, who graduated from Indiana State Teachers College in 1958 with a bachelor's degree in elementary education and completed a master's degree in 1964 from what was then as Indiana State College. Created to honor Newton's 35 years of service to the university, the award is to be presented annually to a person or persons who exemplify the dedication and service of the long-time alumni affairs director. "The Sycamore Spirit runs deep in the Modesitt family," Mary McGuire, foundation board member, said in presenting the award. "Mauri's passion for Indiana State has manifested itself in dedicated service. Mauri is a model Sycamore and he exemplifies the philanthropic spirit we celebrate this evening. His dedication to service and passion for Indiana State has made a great impact on our university family. We are fortunate to have his great example of leadership and service to others as the first recipient of this award." Modesitt served on the ISU Alumni Association board, including a stint as president in 1993, and was interim director of alumni affairs in 1994. He and his wife Janice are active members of the Clay County Alumni Club. They have assisted with the annual golf outing and selection process for student scholarships. Janice Modesitt also attended ISU while earning her nursing degree through Union Hospital. Their daughter, Michelle Modesitt Bell, is a 1982 Indiana State graduate and granddaughter Carlee Bell will be an ISU student this fall. Randall and Nancy Minas received a 2010 Philanthropic Excellence Award in recognition of their financial contributions and volunteerism. A gift from the Minases created the Randall and Nancy Minas Center for Financial Education in the Donald W. Scott College of Business and supports an electronic trading room where students get hands-on experience. At the couple's insistence, the college's award-winning student investment club manages the endowment. A second gift will aid in renovation of the trading room when the college moves into its new home in the former Terre Haute Federal Building. "In addition to these wonderful gifts, both Randy and Nancy volunteer their time to ensure the success of the university and March On! The Campaign for Indiana State," said Larry Boulet, also a College of Business alumnus and co-chair of the March On! Campaign. "Indiana State has been an important part of their lives and establishing the Minas Financial Center allows them to give back to the university and to impact the success of students and faculty in a unique way." Randall Minas is a 1975 graduate of the Scott College of Business. The couple's daughter, Dawn, earned degrees in business administration and psychology from Indiana State in 2003 and their son Randy will complete an MBA at ISU this spring. Randall Minas is a member of the university's board of trustees and Nancy Minas serves on the national campaign committee for March On! Beverly Spear received a Philanthropic Excellence Award in recognition of the generosity she and her late husband Richard, professor emeritus of health and safety, have shown. The Spears established an endowed scholarship in memory of their son, Rick, an ISU alumnus. The scholarship assists first-year students from Vigo County studying in the College of Nursing, Health, and Human Services. Following her husband's death, Beverly Spear established a department award and scholarship in his memory and named the Richard D. Spear Executive Conference Room. In 2006, she contributed to construction of the new Student Recreation Center and provided funds to establish the Rick H. Spear Juice Bar. "The Spears' dedication to student success continues to be realized through Bev's good works and generous support. Her philanthropic spirit extends beyond her financial support as she also enthusiastically approaches colleagues and friends and invites them to join her in supporting Indiana State," said Sherri Daily, professor emeritus of communication and campaign co-chair. "We are proud to have such a dedicated advocate, contributor, emeritus spouse, mother, and friend of Indiana State University." The foundation presented the 2010 Faculty and Staff Philanthropy Award to Jan McCarthy, considered the founder of early childhood education in ISU's Bayh College of Education, where she served as a professor from 1963 to 1992. A gift from McCarthy in 2007 established a fund to promote research and best practices in early childhood education. She represents the field of education on the March On! committee. "Dr. McCarthy has always been up for the challenge," Bobbie O'Neill, a former student of McCarthy's, said in presenting the award. "An avid volunteer throughout her life, Dr. McCarthy has a great deal of experience in fundraising, working with boards and getting the job done. She has hosted alumni and presidential receptions for ISU at her home in Tampa, Fla., and plans to continue working to cultivate alumni and potential donors to ISU. She is always first to encourage others to share their talents and financial resources and acts as a philanthropic role model to her colleagues and former students, all of whom think so much of her." Union Hospital received the foundation's Corporate Partner Award in recognition of its longstanding role in helping to educate students in nursing and other health care professions and its current involvement with ISU and other partners in the Rural Health Innovation Collaborative. Recognized as new members of the Book and Torch Society, which includes individuals who have given $100,000 or more to the university, were Michael Buzash, Jeffrey and Penny Taylor, Gilbert and Catherine Verkamp and Richard Dugdale. Welcomed into the 1865 Society for those who have established a planned gift to benefit Indiana State were Ronald and Barbara Allen, Delores Curtis, Sherry Daily, David and Deborah McKenney, John and Nancy Moore, Donald and Susan Scott, Darrell Wible, Curt and Leslie Wilkinson and David and Joan Zaun. Less than six months after its public launch in October, the March On! Campaign has received more than $56 million in donations and pledges toward its $85 million goal. The campaign is scheduled to continue through December 2011. 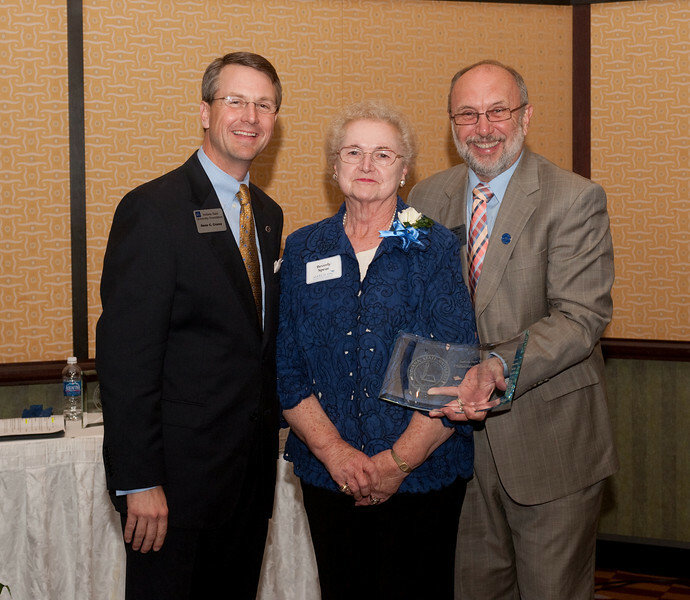 Photo: http://isuphoto.smugmug.com/photos/834707014_YWgZP-L.jpg - Gene Crume (left), president of the Indiana State University Foundation, and ISU President Dan Bradley (right), congratulate Beverly Spear, recipient of a Philanthropic Excellence Award during the foundation's 2010 Philanthropy Awards Celebration April 10 in Indianapolis. The ISU foundation took its 2010 Phlanthropy Awards Celebration on the road in recognition of the university's growing involvement in Indianapolis.